New Forest fungi can be found in an often bewildering variety of shapes and sizes. In fact, of the 12,000 species found in Britain, around 2,700 are present in the New Forest, making this one of the most productive fungus habitats in Western Europe. Indeed, New Forest fungi include a number of internationally important populations. But firstly, whilst fungi is the collective name for these often unusual New Forest inhabitants, many people refer to them separately as mushrooms and toadstools. So what's the difference? Well, there is no scientific distinction: all are simply fungi, although mushrooms are often considered to resemble the cultivated mushroom, whilst toadstools are more oddly shaped, unusually coloured varieties. 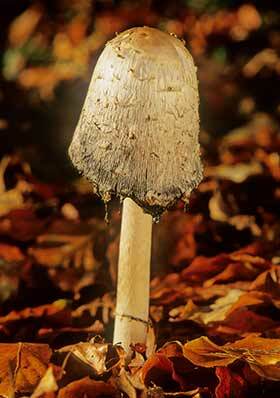 There's also another misconception: that New Forest fungi are mostly present in the autumn. This is not true either, however, for fungi are actually present throughout the year as a mass of threads (called hyphae) that take nutrients from soil, timber and other sources, and usually form the fungi's main means of vegetative growth - the mushrooms and toadstools we see are simply fruiting bodies used to distribute spores that help ensure the growth of new fungi. It is true, however, that September, October and early November are the best months to seek out fruiting bodies of New Forest fungi, although some fruiting bodies are visible throughout the year, whilst others appear in spring or summer. New Forest fungi occur in greatest numbers in woodland, particularly ancient woodland with undisturbed soils and much dead and decaying timber, but some can also be found on heathland and grassland. All shapes and sizes are well-represented, including many of such exotic appearance that introduction from another planet can well be imagined. Colours include reds, purples and yellows as well as just about every shade of brown. Life-styles, too, are equally varied. Some are parasites that take their nutrients from living timber or other material, and give nothing in return; others form a mutually beneficial relationship with particular species of trees or plants, and exchange nutrients; whilst yet more take nutrients from decomposed animal or plant tissues. And there are some real corkers out there. The fly agaric is one of the commonest and most distinctive New Forest fungi. The white stem and bright red, white flecked cap usually appears quite late in the autumn, often under birch, with which it develops a mutually beneficial relationship. The stinkhorn, too, is equally recognisable with a fruiting body that is a hollow, cylindrical stalk, at the tip of which is a conical cap covered in foul-smelling olive-green, spore-filled mucus. And then the Beefsteak Fungus, or Ox-tongue, has been likened in appearance to both a huge tongue, and liver.